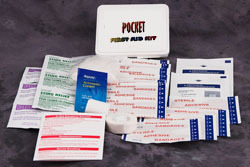 Pocket Kits First Aid Kits make Thoughtful Gifts! These pocket kits are available 5 to a box. For you, for your kids, for your friends... care about the ones you love. Save $1 each by ordering by the box (it will be credited when we process the order). They also make great promotional giveaways! Ask about having your own logo or message imprinted on the kits!